With Solar Matting, a one off payment is now all it takes to heat your pool! 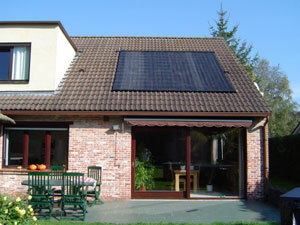 Harness the power of the sun and benefit from free, environmentally friendly heating for your swimming pool. Solar Matting is versatile enough that it can be used in both above ground or inground swimming pools. How does Solar Matting work? 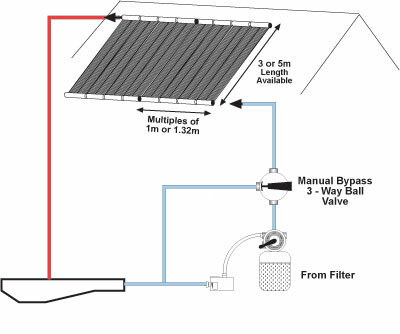 In a nutshell, the Solar Matting is pre-fitted to PVC manifolds which are connected to each other (and must be plumbed directly to the swimming filtration plant). Water is pumped from the pool, passed through the filtration plant and then moved through strips of E.P.D.M Quality P.V.C Solar Matting which absorb heat from the suns rays, thus suitably heating up the water of your pool as it passes through. The size of your pool will determine how much solar matting is required (please see the tables above for details). Where do I fit the Solar Mat? The ideal positioning for solar matting is south facing and set to a 30 degree angle. It can be laid at ground level either flat or on a frame. 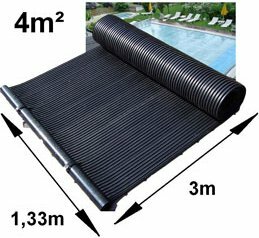 The option to lay pool solar matting on a roof is available but this comes with added considerations. A garage roof is often the chosen site, in this event you may may need an extra "booster" pump to raise the water up to this higher level, the distance to the garage may also need to be taken into consideration. 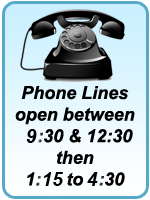 Your existing pump may have the power but if in doubt ring us on 0151 334 0222. The most important requirement for solar matting is that it's placed somewhere with great access to the sun, the perfect direction being south facing (i.e. facing the sun) as this will ensure maximum heat absorption and garner a high performance from your solar matting. 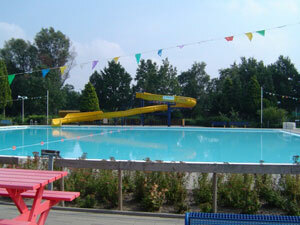 Using a solar cover for your pool greatly prevents heat loss and will help to maintain the temperature of your water. Using a swimming pool heater without one is a bit like turning the radiator on in your house with the window open! In the Winter months solar matting will need to be empty of water to prevent damage from the cold. Solar Matting is more than suitable for commercial pools but please call us for quantity advice.